CHICAGO––For decades, children here had one of the shortest elementary school days in the country, and students were in class fewer days than their peers not only nationally but also in much of the developed world. Rahm Emanuel vowed in his successful 2011 mayoral campaign both to rectify the situation and to give Chicago’s kids a well-rounded education during their additional school hours. And by the fall of 2012, the former chief of staff to President Barack Obama had lengthened the day and year for elementary and high schools alike. Despite a budget crisis, he came up with funds to begin delivering on the second half of his promise. Educators, he said, should not have to choose between offering math or music. But less than a year later, the estimated amount of the Chicago Public Schools’ deficit, caused largely by a crisis in pension funding, had hit $1 billion. Today, the country’s third-largest school system is still giving its 400,000 students more time to learn, but it is no longer giving more money. In fact, it is operating with fewer teachers and support staff than it was before the longer day began. “Funding is not there for a quality day, period, no matter the length,” said Wendy Katten, director of the advocacy group Raise Your Hand and mother of a fifth grader at Augustus H. Burley School. According to interviews with dozens of teachers, administrators, parents and students, Chicago’s longer school day has rolled out with a host of problems, primarily funding-related. The city initially hired hundreds of new teachers to help with the expanded schedule, since it could not afford to pay existing teachers to work longer hours. But now it has eliminated more jobs than it created. At some schools, newly added art and music classes have been cut back, and the mandatory reintroduction of recess without funding for supervision has created a logistical nightmare. The longer time amounts to elementary students being in school an extra hour and 15 minutes per day, high school students having an extra half hour, and everyone attending for 10 additional days. Within certain parameters, principals have the freedom to decide how to use the added hours. Still, much criticism focuses on the one-size-fits-all nature of the policy in a city with vastly diverse needs. Some students in wealthy neighborhoods and at academically selective magnet schools were already overextended with extracurricular activities. At the elite Whitney M. Young Magnet High School, administrators simply added a study hall. 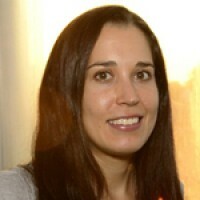 In violence-ridden communities, meanwhile, a later end to the regular academic day has left families worried about their kids getting home safely after dark if they stay to participate in after-school programs and sports. In his campaign victory speech, on Feb. 22, 2011, Emanuel said, “We have not won anything until a kid can go to school thinking of their studies and not their safety.” Chicago school officials say they have not seen participation numbers drop in after-school activities since the lengthening of the regular day, but they take concerns about student safety getting home very seriously. Last night, school system officials announced that they will use $21.5 million in surplus tax increment financing funds to hire an additional 84 art teachers and 84 physical education teachers, some of the positions recently cut. The move comes as the city’s board of education is scheduled to vote Wednesday on a plan to mandate daily physical education for all students, a state requirement with which Chicago has been out of compliance. Educators and advocates say daily physical activity for students is a great idea –– provided schools receive money for staffing, and there have been widespread concerns they will not. Even with the new money, schools will be responsible for covering a portion of the new teachers’ salaries themselves and in time will need to absorb the cost completely. Beth Swanson, Emanuel’s deputy overseeing education, said the mayor remains highly committed to finding more resources for the arts and other enrichment activities. Regardless, she said, having more time for reading and math was sorely needed. The longer day has typically brought more time in reading and math as educators are rolling out the new national Common Core education standards and preparing for a switch to more stringent standardized tests. Around the country, urban educators often find themselves trying to make up for a dearth of educational opportunities in their students’ lives generally. Research shows that by sixth grade, thanks to family and community resources, an affluent child has spent an estimated 6,000 more hours learning than a poor one, creating a divide nearly impossible to reverse. Nearly 85 percent of students in Chicago qualify for free and reduced-price lunch, an indicator of poverty, according to school system officials. Until the 1970s, Chicago students went home for lunch during a long break in the middle of the day. Elementary schools also had a short morning recess and another in the afternoon. All that ended in response to mothers’ changing work schedules alongside a rise in street violence, veterans of the system say. Schools adopted “closed campus” policies, and schedules were shortened to keep everyone indoors as much as possible. Elementary teachers’ lunch was technically scheduled for after student dismissal, and classes let out early enough to ensure students could get home during the daylight. And that’s how Chicago’s elementary schools came to have an instructional day of five hours and 45 minutes, compared with a national average of 6.5 hours. Through the years, violence has continued to plague Chicago, and so have stubbornly low achievement levels –– something a notably short school day did nothing to help. High schools were in session longer, seven hours a day, but also had a longer lunch break. Citywide, students went to school 170 days a year, compared with the standard American 180 –– and 240 in Japan. When Emanuel began promoting plans for more time in school, parents overwhelmingly expressed support. But how much time was the right amount? People could agree that the status quo was too little, but particularly given the budget shortfall, how much was too much? Sixteen parent and community groups representing rich and poor neighborhoods alike banded together to question Emanuel’s initial proposal: a 7.5-hour day for all. They called themselves Chicago Parents for Quality Education, and they thought 7.5 hours was excessive in light of all the other needs in the city’s schools. 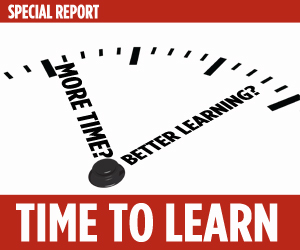 In April 2012, the coalition released a report called The Best Education, or Just the Longest? It detailed concerns that children were not receiving a well-rounded education, with high emphasis on test prep, particularly at the lowest-performing schools. It also advocated for more social and emotional interventions, better early childhood education, and lower class sizes in the early grades. “Providing more time to repeat activities that are failing will not benefit our children,” it said. Emanuel scaled back his plan slightly, to a seven-hour day for elementary schools. High schools would have a 7.5-hour day, and the academic year would be 180 days. Will new teacher evaluations help or hurt Chicago’s schools? In September 2012, what happened was a teachers’ strike, spurred partly by the fact that teachers were being asked to work more without a proportionate pay increase. 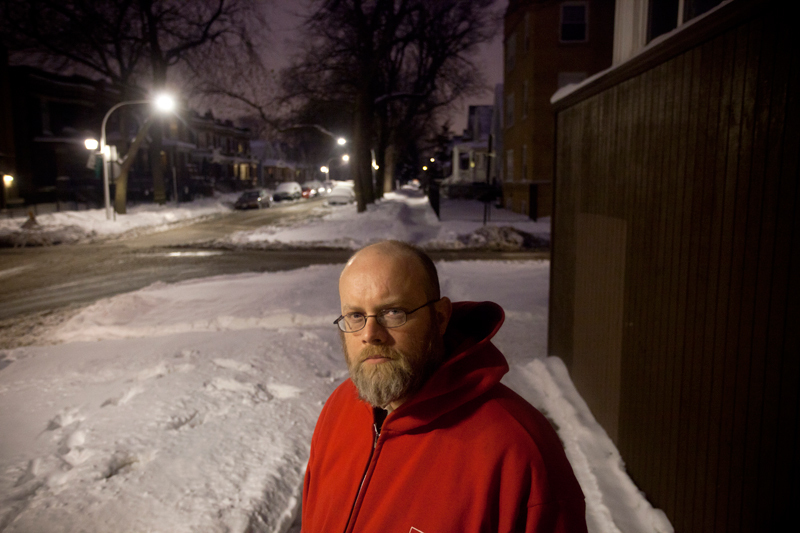 Chicago’s schools were closed for seven days. Under the deal that allowed operations to resume, elementary teachers would be at work for more hours, but with a substantial midday break for lunch and planning. Students, too, would have longer for lunch. Recess –– which can improve students’ concentration, socialization and physical activity levels –– was back, with principals to figure out staffing. And the system would hire new teachers, many in art, music and physical education, as principals decided within the contract’s terms how their schools could best use their additional time and resources. Indeed, budget documents show that last academic year, Chicago Public Schools allocated money for 762 more teachers than in the school year ending in 2012. School system officials said 511 of the new positions –– many in art, music and physical education –– were created specifically to help elementary schools with the longer day, but not all of them were filled. High schools did not receive additional staff automatically since they were not adding as much time. This year, 1,413 teaching positions –– 6.5 percent of all those in the city –– were cut. So were 1,927 school support positions, nearly 15 percent of all the clerks, aides and others who help make teachers and administrators’ jobs manageable. Many schools have seen class sizes swell, alongside a decline in counselors, librarians, and reading and math intervention teachers. Theodore Roosevelt High, on the city’s northwest side, is one school hard-hit by the cuts, losing $1.6 million, or about 10 percent, of its budget. Seventy-five percent of the school’s nearly 1,400 students are Latino, and 97 percent receive free or reduced-price lunch. The cuts meant losing the attendance clerk, who helped track down truant students, and the college and career coach, leaving teachers to help with financial aid forms and college essays. Teachers say the in-school suspension program no longer has a designated staff person to monitor students, many of whom just get up and leave. Roosevelt has cut back on its night school program for those unsuccessful during the regular day and eliminated many elective courses, including the student newspaper. To make use of its additional time, the school added five minutes to every class period. Social studies teacher Tim Meegan said he doesn’t find himself getting any further, and he sees students regularly cutting the last period to get to after-school jobs or pick up younger siblings. Henry saw its enrollment increase this school year, and much of the $200,000 cut from its budget in the spring was consequently restored, since funding is based on the number of students. 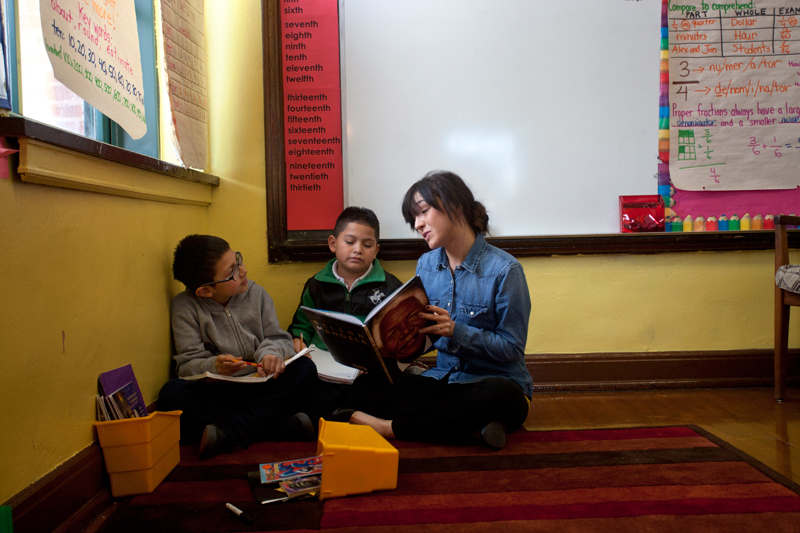 The school is still operating without a teacher to support students learning English as a second language and their families, and it now has a part-time reading intervention teacher rather than a full-time one. The music program was cut, but physical education, health, computers, library and art remain. Principal Januario Gutierrez, a congenial father of five, has assembled a team of highly driven teachers willing to work far longer than even the extended day requires, and scores have steadily been rising. Unlike Tim Meegan at Roosevelt, Henry third-grade teacher Laura Nunn said she’s “definitely able to teach more” with the additional class time. Nunn enjoys having a period built into the day to have lunch, plan and meet with her fellow third-grade teachers, but that hasn’t cut down on the huge amount of work she’s always done outside school hours. While the day starts at 8:15 a.m. and dismisses at 3:15 p.m., she said she typically arrives at 6:45 in the morning and stays until 7:30 at night. “It’s an immense labor of love,” said Nunn, 28, who estimates that she spends $20 a week of her own money on classroom supplies, less than she used to since she’s accumulated materials. Older teachers with families tend to burn out on such long hours, but Diane Meloscia, who also teaches third grade at Henry, has worked that way for years. With three kids and a grandson at home, Meloscia leaves earlier than Nunn, but she said she grades papers and plans lessons late into the evenings and sets her alarm for 5:30 a.m. on weekend mornings to get work in before her family gets up. She said her hours outside school have increased recently because of the more rigorous Common Core standards, not the longer day. “As long as our students need us as much as they do, we will continue working the long hours regardless of the [time] the kids are in school,” she said. Gutierrez, the principal, seems to have successfully navigated a new terrain that has been highly problematic for many of his colleagues: recess. The teachers union contract prohibits principals from asking classroom teachers to supervise recess, which is now mandatory for Chicago elementary schools despite the fact that a quarter of them do not have playgrounds and cold weather often dictates staying indoors. The situation has left numerous principals asking other staff members to step in or scrambling to hire outside contractors to supervise what in the winter often becomes indoor socialization, typically with students sitting in an auditorium. “The longer school day was a well-intentioned idea that was put together with the logic of someone who’s trained in economy and business but not as an educator,” said Leslie Travis, a recently retired Chicago school librarian. At Maria Saucedo Scholastic Academy, which has repeatedly experienced lockdowns because of shootings in the neighborhood, a school of 1,300 has only three counselors, and they are doing lunch and recess duty, as is the special education case manager, said Sarah Chambers, a special education teacher. At William P. Gray Elementary, Principal Sandra Carlson said she spent $65,000 last year on an outside contractor to oversee recess, only to find an increase in disciplinary issues when children are supervised by adults who don’t know them. (Before the longer day, Gray students had a short, teacher-supervised recess.) This year, despite $1 million in cuts to her school budget, Carlson stepped up recess supervision levels and is spending $95,000. While Carlson has found parents unreliable to supervise recess, that lower-cost approach has worked for Gutierrez at Patrick Henry. He pays three of them $14 an hour for two and a half to three hours a day, amounting to about $21,000 total per year. On a frigid recent Wednesday, 90 kindergartners in the auditorium followed along to an exercise video playing on a screen above the stage, dancing the twist as the mothers hired to watch them looked on. It’s too soon to say whether the longer day has impacted student achievement in Chicago, but city and school officials have mentioned it in the context of improved attendance and graduation rates and a decline in the city’s murder rate last year, as well as in highlighting the positives in mixed test results. The community groups that organized around the longer day last spring turned their attention to opposing plans for dozens of school closures. Fifty buildings, primarily in crime-ridden areas, were shuttered. Students were relocated to other schools, often still in their neighborhoods but not as close to home as before. That also had implications related to the longer day. A grant for after-school programming at Anthony Overton Elementary was transferred to Irvin C. Mollison Elementary along with Overton’s students with the closing of the South Side school. 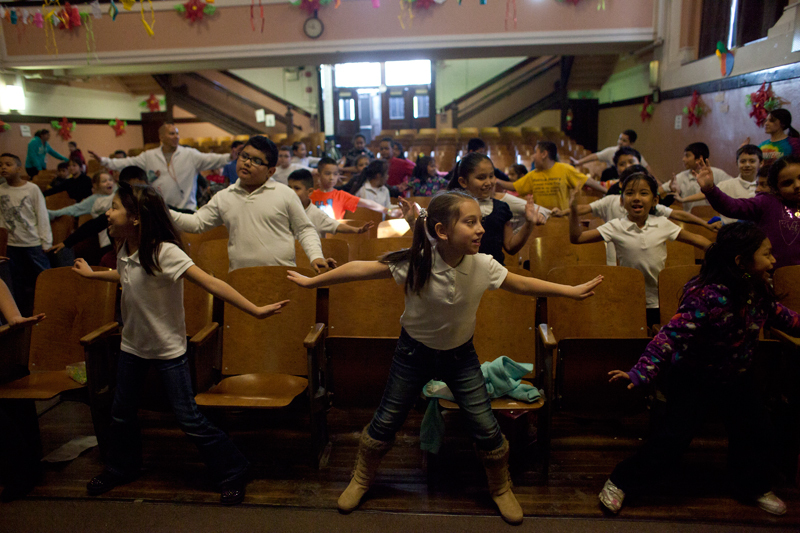 Mollison now has a rich array of after-school offerings, from homework help to hip-hop dance. But busing is only provided at the end of the regular school day, giving the students from Overton a choice between missing out or finding their own way home in the dark in a violent neighborhood. “A lot of them are walking home, which is very dangerous,” said Jeanette Taylor, a mother who chairs Mollison’s local school council, the official governing body. At Overton, Akilra Roberts loved participating on the cheerleading team. Now in seventh grade at Mollison, the 12-year-old again signed up for cheerleading, but she has to miss practice more days than not because her grandmother, Irene Robinson, has no one to pick her up and will not let her walk alone. Robinson, who cares for Akilra and struggles to walk the mile to get the girl because of a debilitating back condition, said her granddaughter’s behavior is deteriorating as she is losing the thing she cares most about school. Jadine Chou, the system’s chief of safety and security, has a staff that works with students and families to develop individual safety plans for outlining transportation specifics, whether getting a ride from another student’s parent or traveling in a group. She said she and her team are committed to making sure students can participate in all activities offered and get home safely.